Erle Stanley Gardner and I go way back—but more about that later. Writing over a million words per year for several decades, Erle Stanley Gardner was once the world’s best selling author. He created several successful book series characters, including D.A. 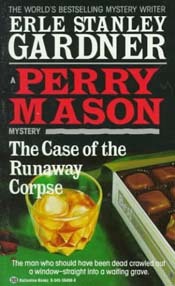 Doug Selby (who appeared in nine novels) and mismatched detectives Bertha Cool & Donald Lam (29 novels), but, obviously, Gardner’s most famous character was Perry Mason, who starred in over 80 novels, a nine-season run on television, and over two dozen made-for-TV movies. I always enjoyed watching Raymond Burr play the TV incarnation of Perry Mason when I was growing up. Years later, while stationed at Fort Ord, my friends and I would watch the reruns during our lunch hour, causing us to be a few minutes late getting back to work. To be on time would’ve meant not finding out who the killer was—unthinkable! Even today, Mason is still with us; Me-TV is rebroadcasting the old episodes. I currently live in Paradise, California, which has strong ESG connections. Young Erle attended nearby Oroville High School in the early 1900s, until he was suspended for being a troublemaker. Despite his spotty academic record, Oroville now claims the author as one of its own, and hosts the annual Perry Mason Days celebration (during which I have portrayed Mr. Gardner on a more than one occasion). Gardner once had a home here in Paradise, near what is today called Perry Mason Lane. His 1954 novel The Case of the Runaway Corpse includes these directions on how to get to his house: “Take the main street through town, then turn left on Oliver Road. At the foot of the grade make a sharp left turn onto Valley View for a very short distance, then turn left again onto Crestview Drive, and it’s the last place on the right-hand side.” Sixty years later, these directions remain accurate in every detail. A lot of people read Erle Stanley Gardner for the “mental exercise” of solving the mysteries. I’ll admit it: I don’t give a rat’s derriere about solving mysteries. In most cases, I’d need to watch a PowerPoint presentation to keep track of the dozens of supporting characters and their various motivations. 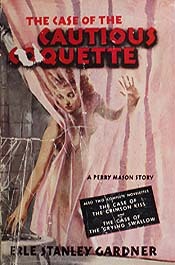 Most recently I finished reading The Case of The Cautious Coquette, a 190-page novella that came out in 1940. It begins with Mason representing the victim of a hit-and-run driver. Mason wants to locate that driver, but has too much success: with the help of private detective Paul Drake, Mason tracks down not one, but two different people who claim to have been the negligent driver, both of which are willing to make restitution. Obviously, one of them is lying, but why? I could go on, but let’s be honest: the plots of all of these stories are instantly forgettable. Far more memorable are Mason’s slick-as-an-eel tactics. In this particular book, Lt. Tragg locates a witness who spotted Mason someplace he shouldn’t have been. This guy never actually saw Mason’s face, but he’s certain he’d recognize his walk. Tragg instructs Mason to get up and walk around for the witness; Mason refuses, and begins his version sit-down strike. Tragg stakes out the building, waiting for Mason to exit, so that the witness can finally see the attorney walking. But Mason never makes an appearance—apparently, he had himself shipped out of the building inside a packing crate. That night, after an anonymous tip alerts the LAPD that Mason is holed up in a seedy motel, the cops bring the witness to the scene. A half-dozen photographers with press cameras are already there, waiting. Amid the popping flashbulbs, the witness (after a bit of police coercion) positively identifies the man coming out of Mason’s room as the same man he at the murder scene. Bad move. It wasn’t Mason, but a hired look-alike, wearing Mason’s hat and coat. Mason was actually one of the photographers, and the pictures taken at the time clearly show the famous lawyer standing right next to the witness as he’s in the act of identifying the wrong man. Care for some aspirin, Mr. Burger? That’s the kind of over-the-top stuff I read Erle Stanley Gardner for. The twenty-page explanation at the end, detailing who did what to whom and why—I pretty much skim right through that part. But, to each his own. I’D RATE IT: 3 out of 5. Don’t answer any questions until I get there!